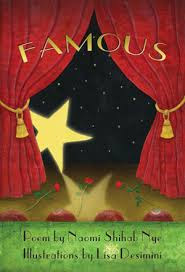 My Merriam-Webster Dictionary gives two definitions for "famous." The first is "widely known." The second is "honored for achievement." Naomi Shihab Nye, novelist, poet, beloved of Texas and famous in both senses, was often asked if she was famous by schoolchildren. She found the question "confounding" and wanted to know why whether she was famous mattered and what it meant. Shihab Nye's answer was "everything is famous if you notice it" and eventually became the poem, "Famous." Now that gives us something to aspire to. The lesson is sweetly inspirational with nary a cliche in sight, dedicated to "Your secret shining self. And to anyone who thinks nobody notices them." Lisa Desimini's illustrations are whimsical and suffused with rich color, including a playful portrait of the the poet and her famous braid. This lovely little volume from Wings Press is appropriate not only for young children but also as a gift in this season of graduations. "Widely known" and "honored for achievement." In this Kardashian-Trump world, it's important that the children we are raising understand the differences between the two. Excellent review! This is a great little book with a powerful message. Thank you, Bryce! It's a gem.